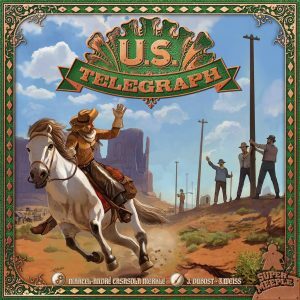 Paul: We know it’s Games News time when we hear the honk of the Games News Freighter (SS Games News) as it makes its way up the Games News channel, to disgorge Games News upon the Games News docks. Quinns: OH NO A MAN HAS BEEN CRUSHED. Paul: Such is the weight of Games News and the danger of not taking things easy. We should all relax with Alubari: A Nice Cup of Tea (seen above). Oh no wait, you’re also building a railway together. 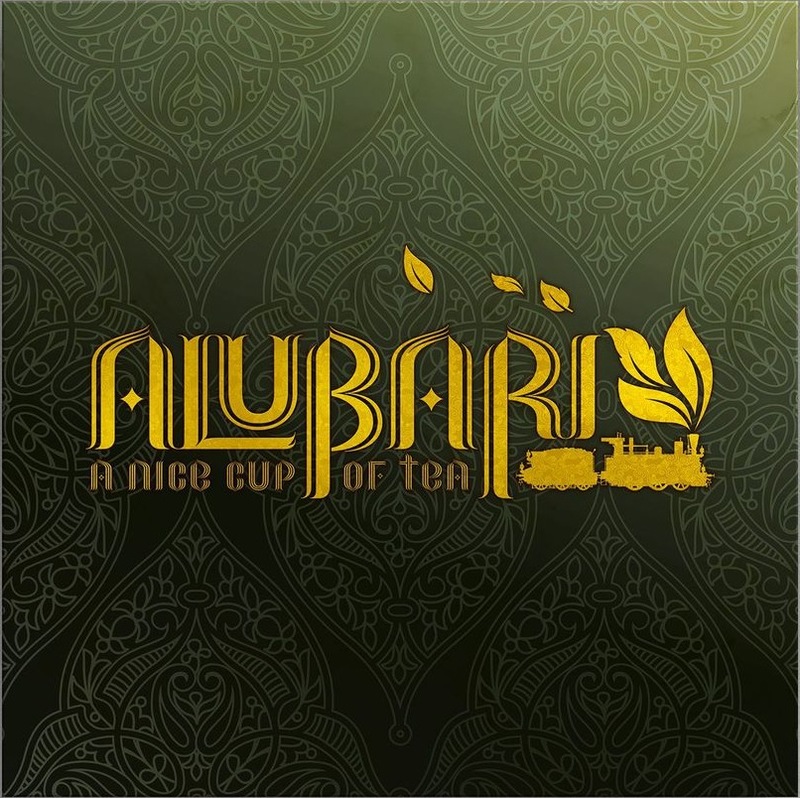 BUT STILL, Alubari: A Nice Cup of Tea looks just wonderful. As well as using worker placement mechanics to cultivate tea (even feeding it back to your own staff, to help them work), you’ll all contribute to that railway and to building towns along it. Then, at the end of the game, whichever of you contributed to tea, trains and towns the most is the winner! All that, and the box has a lovely cover. Quinns: Colour me interested! 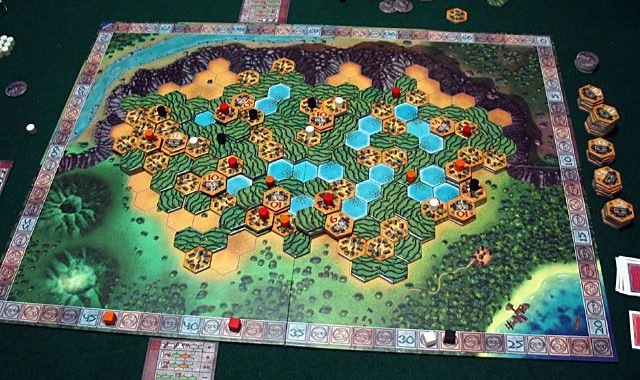 Alubari is the sort-of-sequel to a game called Snowdonia, which we never played but which we heard very good things about. This game should be a lovely way to catch up. That said, I’m not crazy about the theme. Planting tea and building railways in 1850s India was of course being done by the British, for the British, and there’s certainly enough cruelty to be found in the history of the British East India Company that “A Nice Cup of Tea” could be taken as an arch and sarcastic subtitle. Fun fact: After these railways were built using Indian taxpayer money to secure British investments, the trains and stations were staffed by white people. The Indians paid for the trains and stations but they couldn’t even work in them. Of course, these days India’s very proud of its tea industry. I guess as an English person I just have a chip on my shoulder about colonial India because we’re taught so many lies about it. Photo credit: BGG User ChangoPerro. You know what the exact opposite of a nice cup of tea is? Warhammer 40,000, the future in which There Is Only War. Except for when it’s also thematically appropriate to have some non-war. 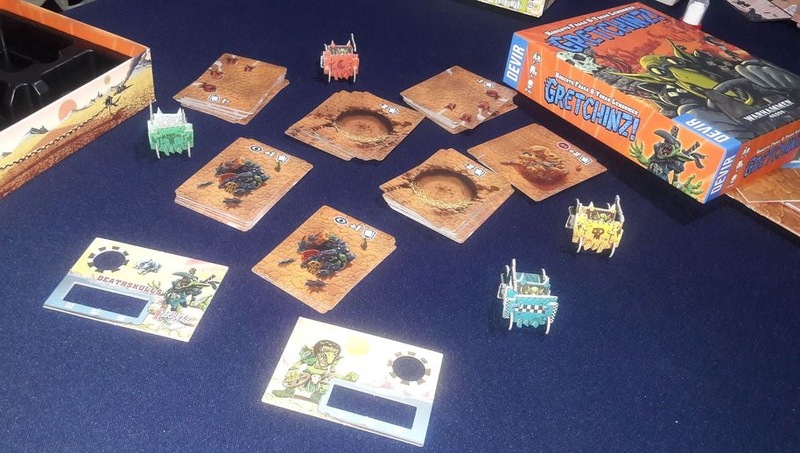 Such as in Gretchinz!, the game of racing tiny space-goblins, from Captain Sonar designers Roberto Fraga and Yohan Lemonnier! It looks like its creators want this game to be as slapdash as Sonar is, with frantic, real-time dice rolling and players holding cards in a Hanabi-style fashion that means they can see what everyone else has, but can’t be entirely sure what they hold themselves. I know the old adage is “more haste, less speed,” but sometimes you just have to panic as fast as you possibly can and hope it works out. Right? Right? Quinns: Here’s an interesting rebirth. Cuzco is a remake of the year 2000’s Java (pictured above), the first game in the mechanically-related Mask trilogy, which also includes Tikal (which has a mediocre iPad port that’s I’ve nonetheless enjoyed) and Mexica (which we reviewed here). While Java was set in, well, Java, the remake airlifts the game to South America, meaning all three now take place on the same continent. Paul: I don’t understand. Why wasn’t it set there before and why did it take eighteen years to change this? No, it’s okay, it doesn’t matter! This is an important reminder that, after enjoying Mexica, I need to try the other games in what is now a fairly venerable series. Several friends are fans of Tikal and this new, swankier Cuzco looks like a game that just demands our attention. Could this be a series that keeps pace with its shiny peers, even after nearly two decades? Quinns: I don’t know, but one thing’s for sure- French publishers Super Meeple are putting out some absolutely gorgeous boxes. The whole revised Mask trilogy look amazing, and I’d love to get my hands on their new edition of Amun-Re (though I don’t think it’s out in English yet). Paul: Oh boy, there’s lots resurfacing this month. 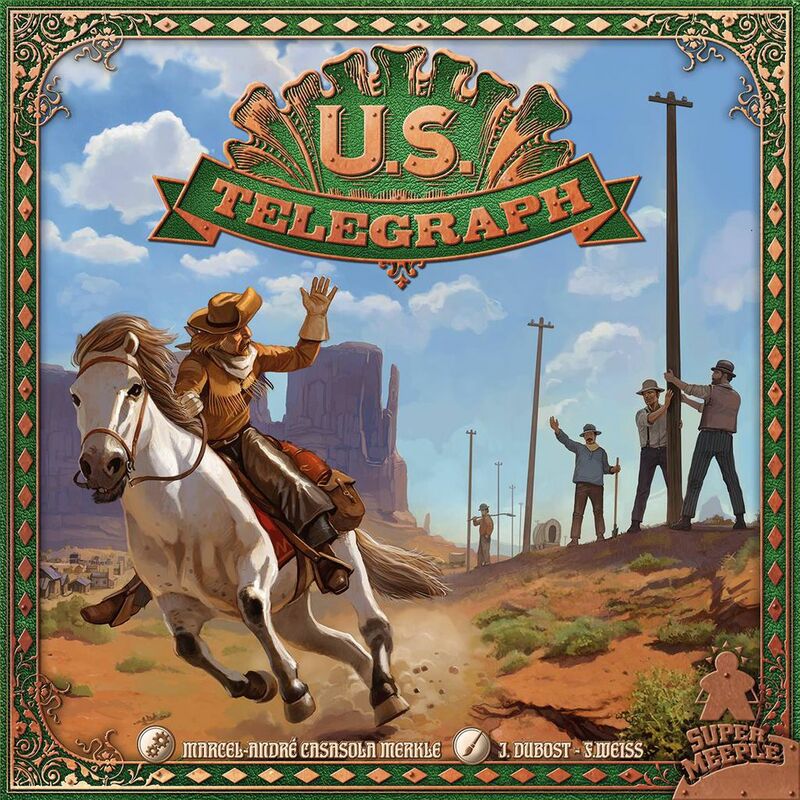 A similar re-theming turns 2003’s Attika into U.S. Telegraph, meaning it’s no longer a game about building Greek city-states, but instead towns on the American frontier. Mechanically, though, its creators say it remains the same. How curious! And we also have a re-release of Mage Knight coming, right? Quinns: Paul it’s the ULTIMATE EDITION. 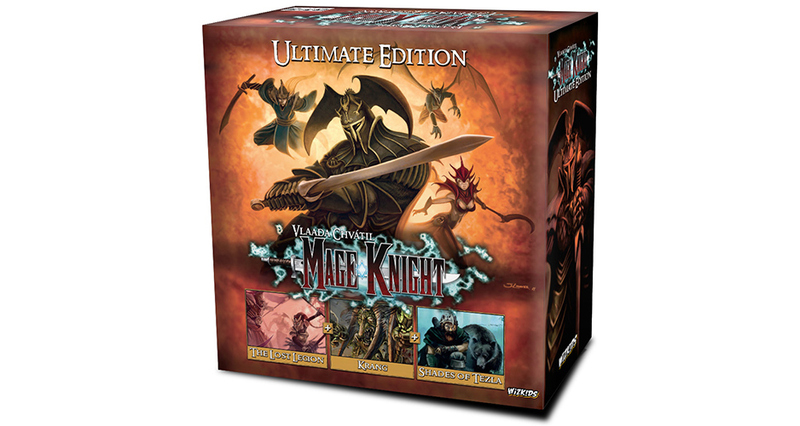 That means all of Mage Knight is now packed together in one single $125 box with, wait for it, “five all new cards”! Five new cards, Paul! The base game is already huge, and the first expansion alone makes it monstrous. Is your $125 really necessary? Paul: Sometimes you just got to milk that cash cow until you hear the last nickel hit the bucket, plus you know me. Five is my favourite number. Five new cards is the perfect amount to make me holler with happiness and ride my horse off into the sunset. Five new cards! Five! Paul: While we’re on the subject of ultimate things, Ultimate Werewolf (see our review here) is the latest game to buy first class tickets to legacy land, with a new edition coming this August and co-designed by the man who has come to be known as “Mister Legacy” at every cocktail party, Rob Daviau. 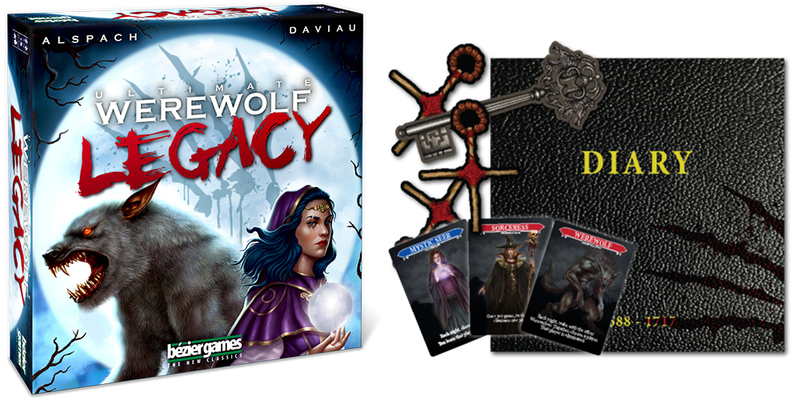 At its core, it’s still the traditional game of hidden roles and hamlet hunger, with players trying to either eat one another or avoid becoming dinner, but Ultimate Werewolf Legacy will, as we’d expect, feature a bunch elements that carry over between games. These include a player’s family loyalty (perhaps even disloyalty) and special powers, as well as the gradual growth and development of the village they live in across sixteen game sessions. The action is both dictated by and recorded in THE DIARY, a log that is central to the game’s progress, and publisher Bezier say that it’ll be worth replaying UWL, as new games may take very different turns. Replay packs will let players buy a NEW DIARY and begin the betrayal again. 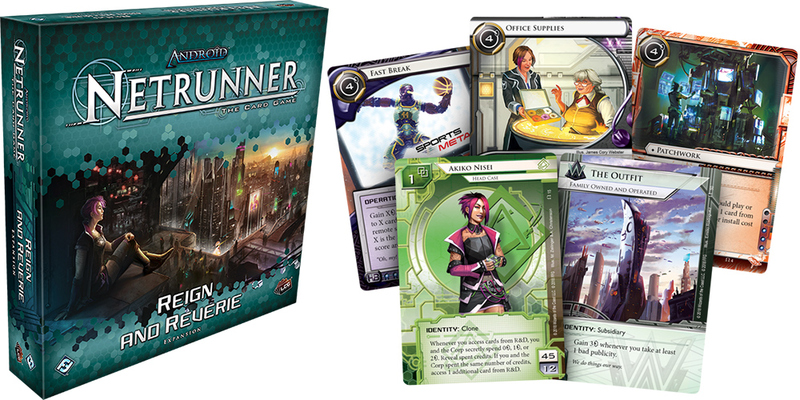 Quinns: It’s been a while since I was able to give expandable card game Netrunner a nod, but this week we have the announcement of the latest deluxe expansion, Reign and Reverie! Set in the sprawling megacity of ChiLo (stretching from Chicago to St. Louis) it’ll add loads of cool new cards for every faction, and it’s designed to be a perfect second box to pick up after new players buy the revised Core Set. I burned out on Netrunner after attending twenty tournaments and hundreds of meet-ups, but Shut Up & Sit Down still absolutely recommends it. It’s just genius. If you’re looking for a new obsession or just want to see what all the fuss is about, you should still absolutely pick up a copy. Paul: And finally, we’ve got a Kickstarter for you! 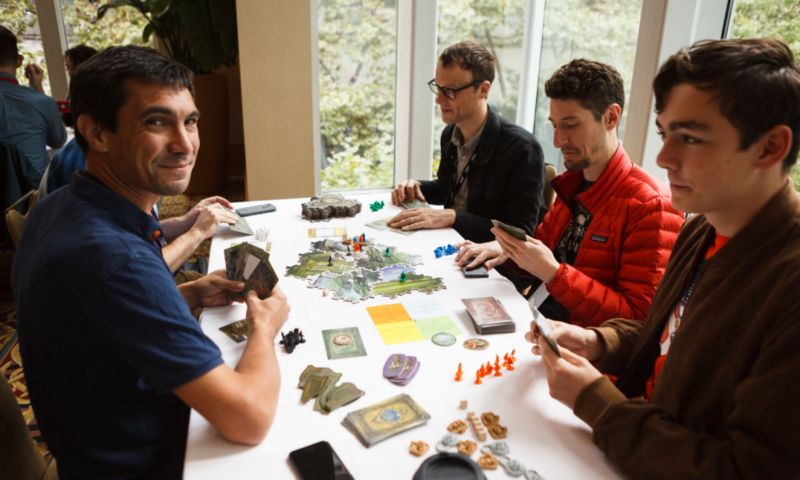 Eagle-eared visitors will remember Matt talking about Edge of Darkness when it turned up at SHUX last year (and then again in this podcast). 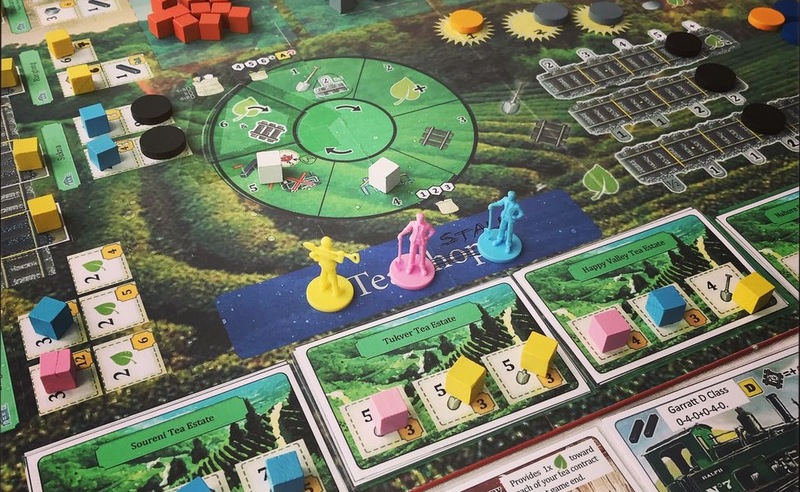 This huge game of worker placement, economy management and card customisation (previously seen in Mystic Vale, from the same designer) looked absolutely fascinating to me. Well, it’s now on Kickstarter and, as you might expect for something so enormous, has exercised its black-hole like powers of attraction to bring in hundreds of thousands of dollars. The darkness is closing in, you could say. Look, its edge is getting closer. Quinns: Yes! Matt and I were split on this after playing it at SHUX. It didn’t click for me, he found it intriguing. …Goodness gracious. I just looked closely at this Kickstarter for the first time. There are two levels you can back at, a $60 level that gets you the game, and a $100 option that includes a crapton of extras, stretch goals and miniatures to replace the tokens. 98.2% of backers went for the more expensive option. Quinns: They chose to almost double the price of the game. Quinns: Paul, do you think people who use Kickstarter like miniatures and lots of pieces? Paul: There’s just no way to know for sure.